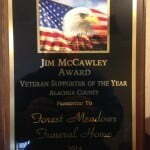 The Alachua County Veterans Memorial Committee held it’s Annual Veterans Award Banquet on January 31st. This was the groups 10th Award Banquet and a record crowd of close to 350 citizens attended the ceremony held at the Paramount Hotel in Gainesville. Gathering to “Honor those who have made outstanding contributions to the Alachua County Veteran Community” attendees were treated to music by the Jamie Davis Band, raised funds through a silent auction and enjoyed dinner with friends and family. Notable guest included Medal of Honor recipient USMC Corporal Duane Dewey, Generals David Kratzer (US Army) and Paul Albritton (USAF) and Tom Wisnieski (Dir, North Fla/South Georgia VA Health Care System. In addition many active duty military personnel were on hand proudly wearing full military dress uniforms. 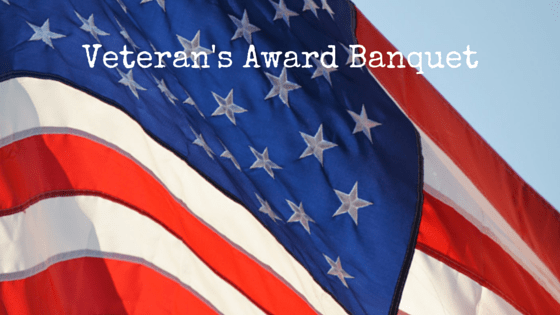 Over 21 individuals, families and businesses were nominated for the prestigious Veteran of the Year, VA Employee of the Year, All American Patriotic Family of the Year and Veteran Supporter of the Year awards. After a suspenseful evening of learning why each was nominated and photos taken the winners were finally announce. Vickie Van Buren (USAF and Commander of American Legion Post 16 was 2014 Veteran of the Year, Sean Turner (Chief Medical Admin) was VA Employee of Year, Douglas Family (with over 300 years of combined military service) was All American Family of the Year and Forest Meadows Funeral Homes was proudly selected as the 2014 Veteran Supporter of the Year. 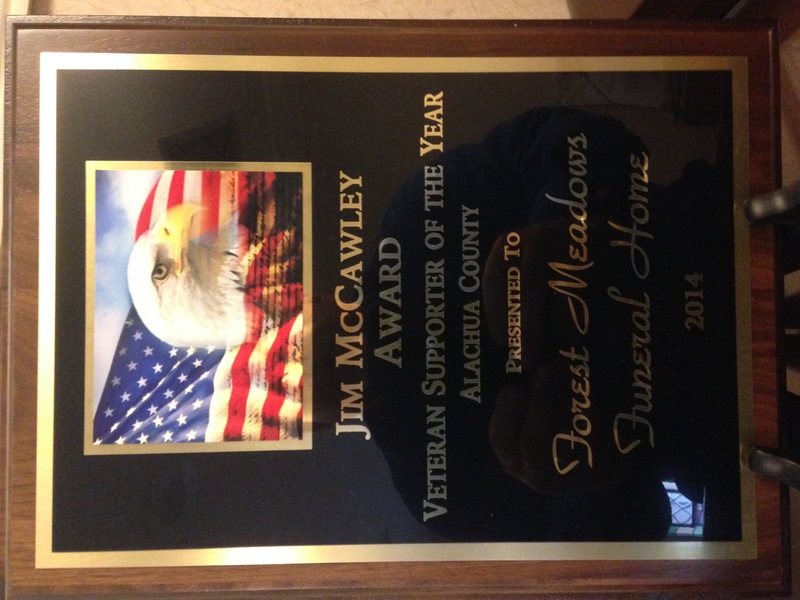 The selection of Forest Meadows to receive this award came as no surprise to most in attendance as Forest Meadows has long been a supporter of our veteran community. They have hosted our Annual Memorial Day Community Ceremony for many years at their cemetery off Hawthorne Road. This annual event draws over 300 patriotic citizens in which Forest Meadows provides a free BBQ for all. They provide assistance and personnel to ensure our Annual Veterans Day Ceremony is a continued success. Forest Meadows also provides on-going financial assistance to numerous veteran organizations and has contributed to the Veterans Bridge Scholarship at both SFC and University of Florida to help young student veterans adjust to civilian student life. Perhaps the biggest news of the year was that Forest Meadows has been selected, by the county memorial committee, to receive ten monuments listing all local servicemen who have been killed in action fighting in our nation’s wars. These monuments, currently located at Kanapaha Veterans Memorial Park, had been scheduled for demolition when the memorial is to be renovated later this year. Now these honored monuments will be transferred to Forest Meadows “Military Garden of Honor” for permanent safekeeping. Friends and family at Forest Meadows invites our community to this year’s 2015 Memorial Day Ceremony. This patriotic event is set for May 25th starting at 11:00 am includes presentations from state and local leaders, a young marines flag folding ceremony, a Gainesville Fisher House update, numerous displays from area veteran organizations and concludes with a wreath laying ceremony and rifle salute. Attendees are then invited to enjoy a free BBQ hosted by Forest Meadows.